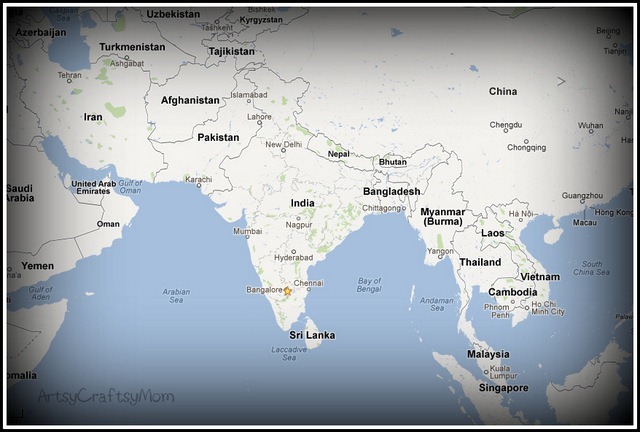 Today’s Exploring Geography post comes from Shruti at Artsy Craftsy Mom – a blog about crafts, books, recipes, and life. 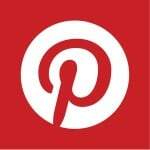 Here are three posts I love from Shruti’s blog: Paper Plate Seasons Craft, Beaded Pipe Cleaner Caterpillar, and Australian Aboriginal Art. Hi kids, today we are going to explore exotic India. Have you heard about Mahatma Gandhi? He was a peace lover and a great patriotic leader from India. He is known in India as the Father of the Nation. He taught others how to lead a simple life and to treat each person of this world as family. There is an interesting story about Gandhiji. He always used to wear a very simple “dhoti” a long cotton wrap around his legs and a cotton cloth around his shoulders. A small child saw him and was very distressed. Why is Gandhiji wearing such simple clothes he thought. He went up to him and said, “Gandhiji, my mother is a tailor. She will stich a nice pant and shirt for you.” So Gandhiji smiled at the little boy and said.. ” But I have a very large family. Unless all my brothers and sisters have shirts like mine, I can’t wear one myself” .. The boy still persisted.. “Tell me how many you need? My mother will stitch them for you” .. then Gandhiji replied .. “I need 4 crores.. All Indians are my brothers and sisters. Until all of them wear shirts, I will not wear one myself” Such was his love for his country.. The Taj Mahal is in India. It is one of the 7 wonders in the world. 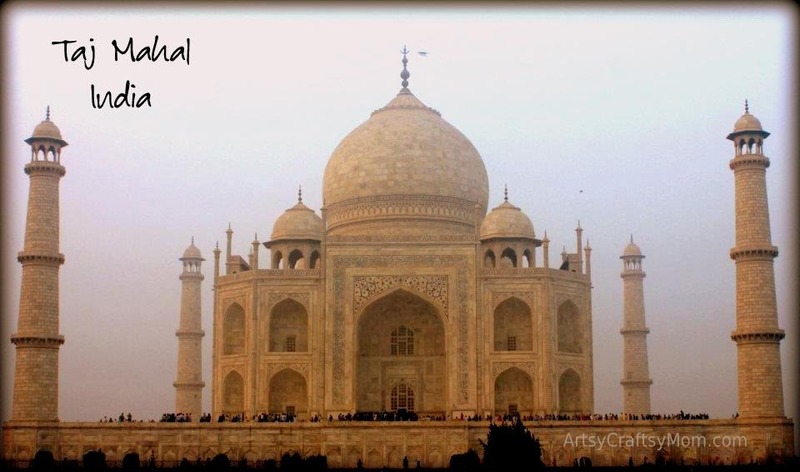 In 1631, Shah Jahan, a mughul emperor built it in memory of his beautiful wife Mumtaz Mahal. It still stands today as one of the most iconic buildings in India. 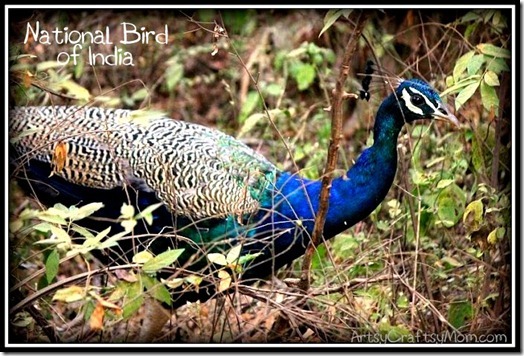 The peacock is the National Bird of India and one gets to see them strutting their beautiful feathers when it rains. 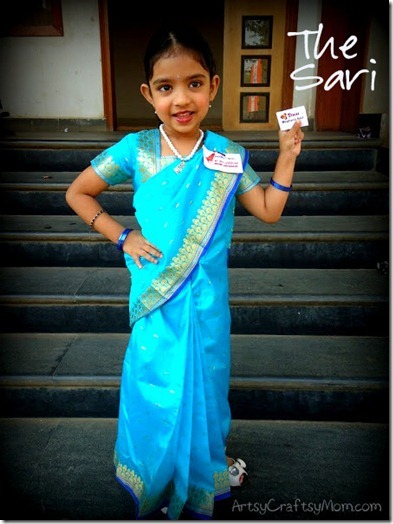 Most ladies commonly wear a sari in India. It is a 6-yard piece of cloth that is wrapped around the body. Most Indians are Hindus, and follow a religion called Hinduism. We worship a lot of gods – almost a million of them, unlike Christians. Since we have many Gods, we have many festivals too. But each festival has its own Puja ( or worship) .. During a Puja, we have a Puja Thali (plate) that is used to store flowers and other ingredients required for the Puja. Go here for a tutorial on how to make a simple Puja plate. I hope you enjoyed the mini tour of India today. 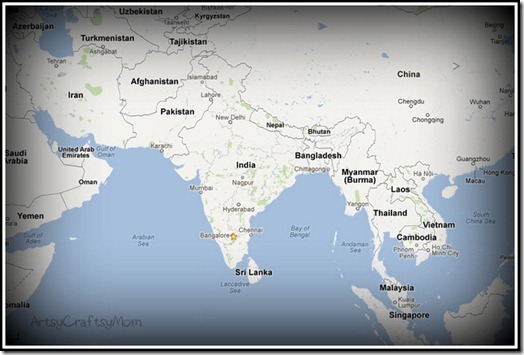 Until next time, Bye Bye from Shruti & Lil P .
Thank you, Shruti, for this introduction to India! I especially enjoyed your stunning photos! 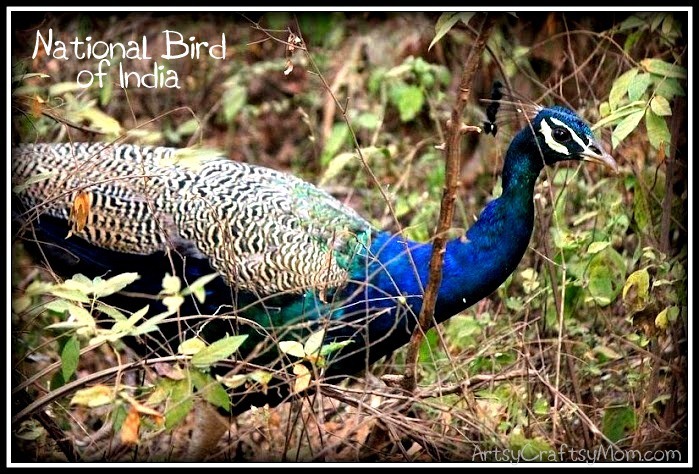 I didn’t know the national bird was a peacock. I’ve always thought peacocks were gorgeous. :) We love peacocks too. Wow – I love those pictures! 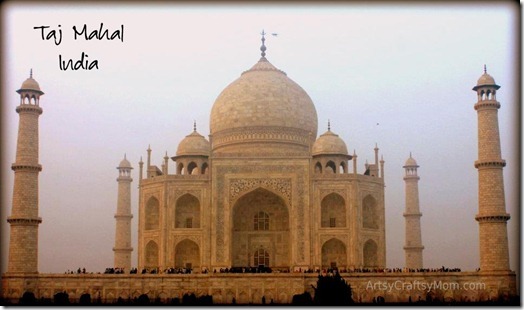 The Taj Mahal just takes my breath away, and it looks like I could reach out and touch that tiger… if I dared! Very informative post! I love it. 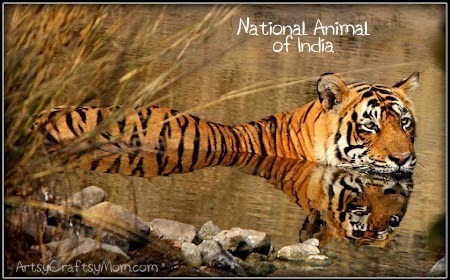 I have always wanted to visit India and this just made me want to even more. Gorgeous photos! My youngest ended her school year doing a report on the Indian peacock. What beautiful pics! Came over from Shruti’s. What a super initiative. Loved the way India is presented here. Bu my fav is Lil P in that sari :-). Muah! Shruti’s photos are incredible, and Lil P is adorable! Thanks for dropping by! I love India! One day I will make it to the Taj Mahal. 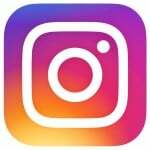 Thank you so much for your guest post – it is lovely! Really? The peacock! It makes since, with all the beautiful colors…and their women wear lots of beautiful colors! I have always wanted to see the Taj Mahal! Your daughter looks absolutely beautiful and adorable in her Sari. We had fun with my daughter’s class this year with bringing in various clothing from India. The length of my Sari stretched clear across the class with all the students holding it, such fun. Thanks for sharing such beautiful photos of India, an amazing place to visit!